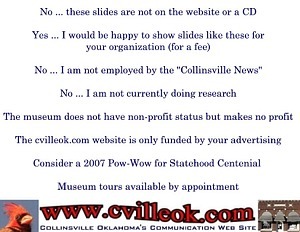 Ted Wright Presented Slideshow from Archives of The "Newspaper Museum In Collinsville"
These are just a few of the slides and photos shown yesterday at the Collinsville Chamber of Commerce monthly meeting at the Library. 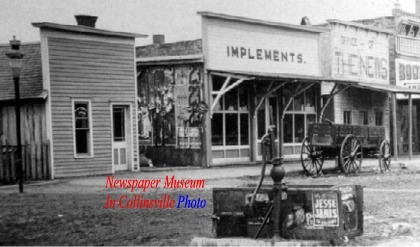 The words above describe "old town" a mile east of present day Collinsville in 1897. The town well below was in the intersection of 11th and Main at the "new" town site in 1906. 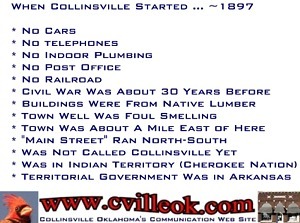 Businessmen in Collinsville organized a hugh celebration just before Oklahoma became a state in November of 1907. 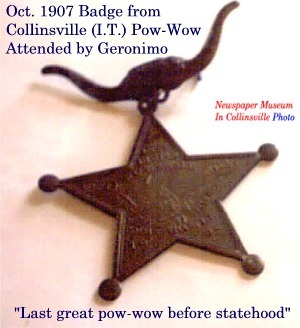 The almost week long event held in Collinsville, (Indian Territory) in October 1907 included a a fair with a carnival, greyhound races, jack rabbit races, canned goods, livestock. There were also stomp dances each evening by the many indian tribes represented here by: Geronimo (Apaches), Quanah Parker (Comanches), Lone Wolf (Kiowas), Spybuck (Shawnees), O-lo-co wah-la (Osage) and Chief Rogers (Cherokee). Later reports indicated some visitors traveled from as far away as New York City to attend. 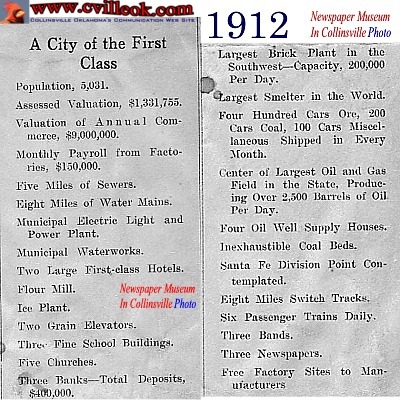 With large zinc smelters here (from 1911 into the 1920s) Collinsville's population rose to as large as 8000 and many of the current downtown buildings were built. With the demise of the smelters, Collinsville's population declined for many years.